"Wake up," my wife shouted. "We are at war!" A few moments earlier, she met Vladimir Simagin pacing back and forth in the lobby of the Polish hotel in Polanica Zdroj, repeating:"Stupid people, stupid people, stupid people...." The Moscow grandmaster explained to her that Soviet tanks crossed into Czechoslovakia overnight. It was August 21, 1968. "The night would not be short," predicted the Czech poet Karel Kryl in one of his songs. 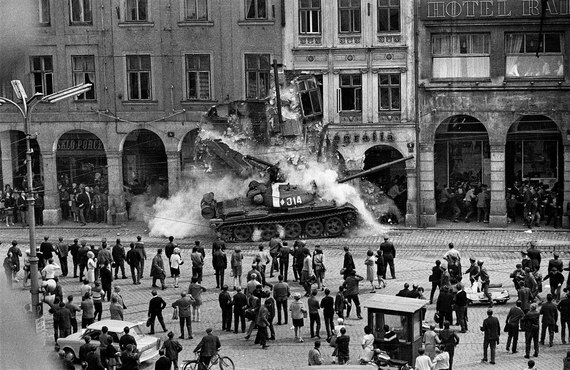 On Vaclav Touzimsky's iconic picture, a Soviet tank crashes into a building in the town of Liberec. The tank has one white stripe, not the the usual red star. The Soviets used more than 6,000 tanks during the August 1968 invasion. 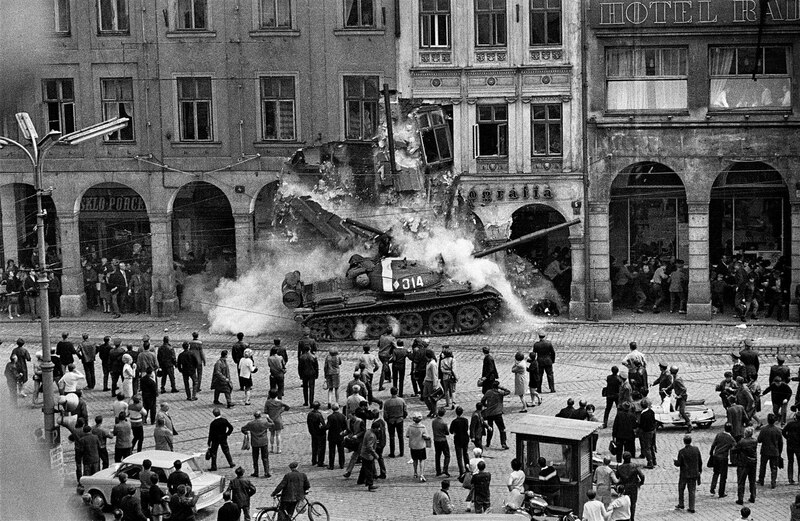 They came to quash what became known as the Prague Spring, a seven-months attempt to "humanize" communism. Chess was played and often flourished under totalitarian regimes, military juntas and in the middle of wars. How did the chessplayers deal with that? Did they raise their voices against the leaders of their own country or did they keep silent? In the Polish spa Polanica Zdroj in August 1968 we continued to play chess. The former world champion Vassily Smyslov, with whom I fought for first place, kept to himself and was quiet. Simagin was exhausted and distressed. The Soviet players spent better times together. Simagin was Smyslov's coach during his world championship matches in the 1950s. As fate would have it, I played Simagin in the penultimate round and I knew that the man across the board disagreed with the Soviet occupation. He was a chess philosopher believing that violence has no place in our lives and it is best to leave it on the chessboard. We played nervously, exchanged a lot of pieces until we were left only with my rook against his knight. 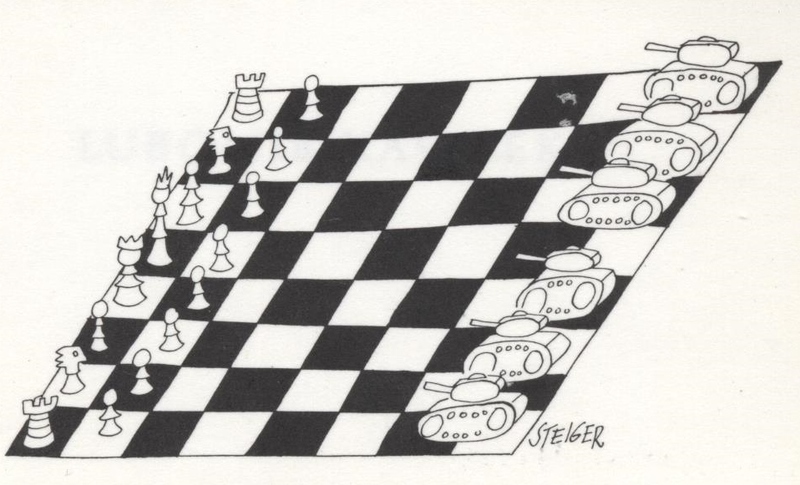 We sensed that in an absurd, symbolic way the single rook was fighting against thousands of Soviet tanks. Eventually, we agreed to a draw, but the invasion broke his heart. Simagin died of a heart attack during the tournament in Kislovodsk on September 25, 1968 at the age of 49. At the Lugano Olympiad in October 1968 Jan Smejkal asked his Czech teammates to play against the Soviets wearing a black ribbon in their lapels and most of them did. Boris Spassky was outspoken. "The Czechs also fight for us," he said in front of the Soviet team and their KGB informant. After another Czech grandmaster, Ludek Pachman, boycotted the participation of Smyslov in Athens in December, the Soviets boycotted Pachman for years. "No Soviet flag on my table," I told the organizers of the 1969 tournament in Wijk aan Zee and Mikhail Botvinnik and Paul Keres played without the red flag. Keres understood: the legendary Estonian grandmaster played tournaments in countries annexed by Germany during World War Two. It almost cost him his live after Stalin grabbed his homeland after the war was over. I left Czechoslovakia on September 1, 1968 and was able to go back only after 21 years. It took 23 years before the Soviet occupation of Czechoslovakia ended in 1991. And the Czechs showed what they thought of Soviet tanks. The one that came to Prague in 1945 was painted pink and was left floating on the Vltava river during the Week of Freedom in 2011. In December 1991 the Soviet Union collapsed and ceased to exist. It was split into many countries and that didn't go over well with Vladimir Putin. As soon as he came to power, he plotted how to get back the Soviet territories. And this led to the current situation. Russia is at war again. The armor and the little green men Vladimir Putin sent to Ukraine this year to annex Crimea and to carve up the mainland were also without Russian insignias. Russian tanks tend to invade at night as if ashamed to be seen. Their favorite time for invasions seems to be August (Czechoslovakia 1968, Georgia 2008, Ukraine 2014) or during the Olympic Games (Georgia 2008, Ukraine 2014) when the world is distracted. They come under the pretense of "brotherly" or "humanitarian" help. They even use chess strategies in their action: the principle of two weaknesses - creating threats in two separate places - is applied in the Ukraine as we speak. Putin helped Kirsan Ilyumzhinov to win the FIDE presidential campaign. They announced together that the next world championship match between Magnus Carlsen and Vishy Anand will take place in November in Sochi. Carlsen, now playing the Sinquefield Cup, has till Sunday to accept, although the conditions of the match are far from clear. FIDE already shaved one million dollars off the previous match budget. Ilyumzhinov is staging other major events in the former Soviet territories. The Chess Olympiad in 2016 will be in Baku, Azerbaijan and in 2018 in Batumi, Georgia. Grand Prix tournaments - important qualification events for the world championship - are scheduled for Moscow, Baku and Tashkent, Uzbekistan. There is also another one in Tehran, Iran, but it is hard to imagine the American Hikaru Nakamura playing there. Or for that matter the Armenian Levon Aronjan playing in Baku. And some of the events will be played while Putin is aiming his guns at Ukraine. Vladimir Simagin was an excellent chess theoretician and thinker, inventing many deep ideas in the openings and middlegame. Once he was asked whether chess style can reflect a player's character. Simagin gave the example of Adolf Anderssen, the world's best player in the mid-19th century, known for his "Immortal" and "Evergreen" games. Anderssen was born in Breslau, Prussia, and lived and worked there quietly most of his life. And then Simagin pointed out Mikhail Tal and his wild life. Two different persons, each capable of creating beautiful, stormy and surprising attacks. When Simagin was told that the most beautiful creations in chess are long combinations with unexpected first moves, not anticipated by the opponent and the spectators, he replied:" It is not in the first move, but in the ability to create a position where the first move of a combination is possible." 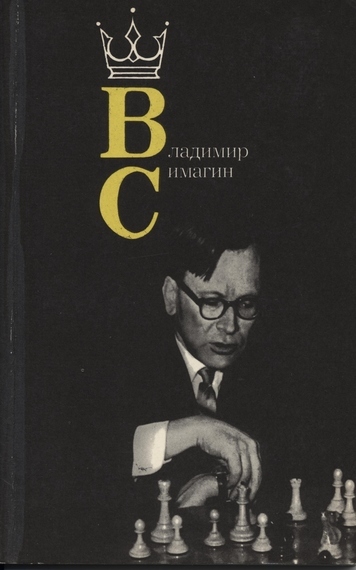 His game against the three-time Soviet champion Leonid Stein is a nice example. Simagin deliberately plays into a position in which he seems to be lost. With a magical move he turns the game around and wins. Simagin won the prize for the most beautiful game, going against one of the world's best tactical sluggers. The position after move 27 is from the Poisoned Pawn variation of the Najdorf Sicilian. Simagin seems to be outplayed, but he has still some tricks up his sleeve. "The only way," Simagin writes. After 31.Bxb5 Rxe3! (31...Bxe3? 32.Bxd7 Nxd7 33.Nc4 Qc5 34.Nxe3 Rxe3 35.Rxh4=) 32.Bxd7 Rxh3 33.Nc4 Rxh2+ 34.Kxh2 Qg3+ 35.Kh1 Ke7 black is better. Simagin explained that Stein hoped for 31.Ng4 and intended to refute it with 31...Rxh3 32.Nxe5 Rxh2+! 33.Kxh2 Qg3+ 34.Kh1 Qxe5 and black wins. A. 33...Bxf8 34.Qxf6+ Kc8 35.Qxe5 Rc1! ?= (35...Rxe3 36.Qd4 Bc6 37.Qb6 Bd7 38.Qa7 Bc6 39.Qb6 repeating the moves. B. The computers improve with 33...Kc7! 34.Qxf6 Rxe3 35.Qd8+ Kb7 36.Bf1 Bxf8 37.Rxd7+ Nxd7 38.Qxd7+ Kb6 39.Qd8+ Kc6 40.Qc8+ Kd6!! 41.Qxf8+ Ke5 and black retains winning chances. Just one slip and black is lost. The game could have ended abruptly with a repetition of moves: 32...Ng6 33.Rh7 Ne5 34.Rh8=. After 34...Qc5 35.Nxb5+ Kc8 (35...Kc6 36.Rd6+ transposes to the game.) 36.Qxh8+ Bd8 37.Nd6+ Kc7 38.Qb2 (38.Qxd8+ Kxd8 39.Nb7+ also wins.) 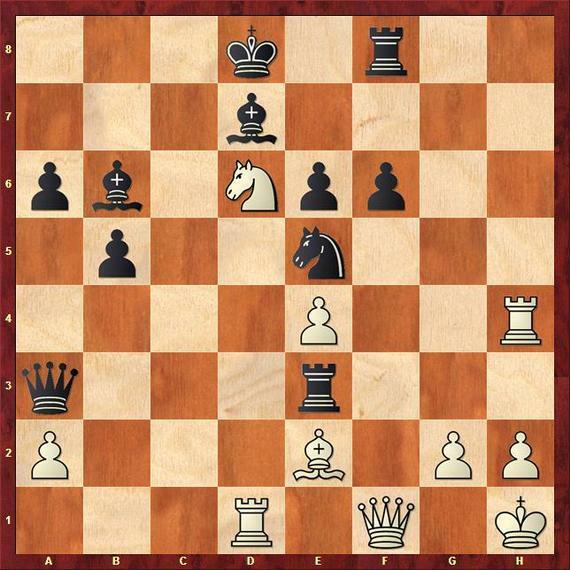 38...Qc6 39.Rb1 Kxd6 40.Qd4+ Ke7 41.Qxe3 and white wins. Simagin gave a different line: 34...Rxh2+ 35.Kxh2! (35.Qxh2?! 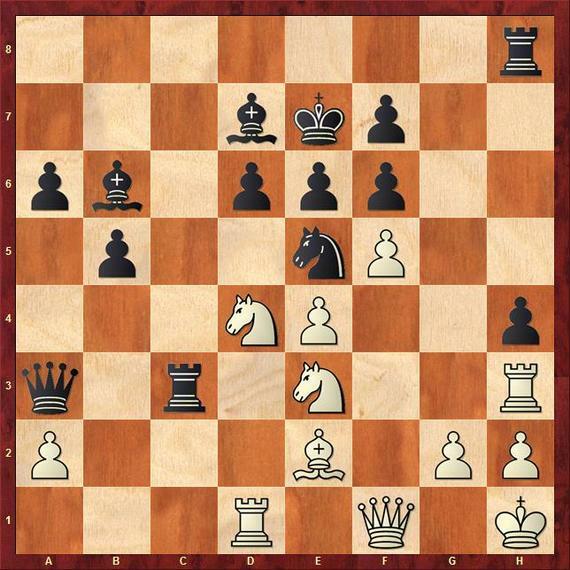 Rg3 or even better 35...Kc6!=) 35...Qc5 36.Nxb5+ Kc8 37.Qh8+ Bd8 38.Nd6+ Kc7 39.Qxd8+ Kxd8 40.Nb7+ wins. 35...Qe7 36.Rd6+ Kb7 37.Rxb6+ Kxb6 38.Qc7 mate. After this move, Stein smiled. There is no way out for white, he thought. In his mind the game was over. 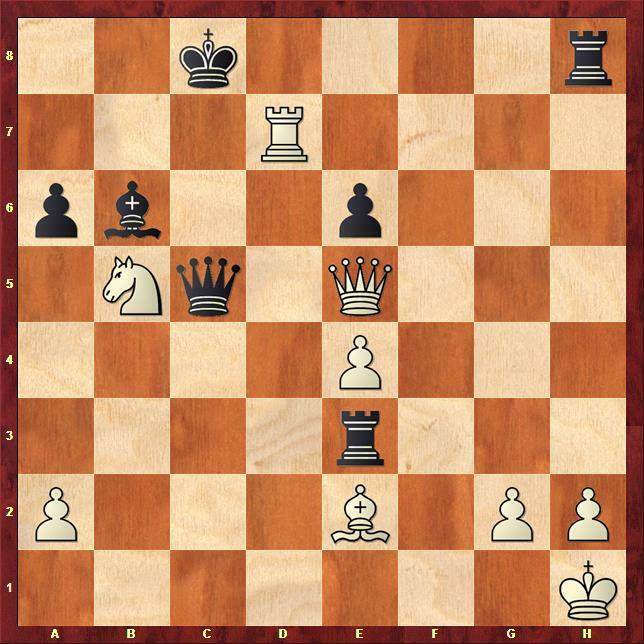 It certainly does not look good for Simagin: all his pieces are hanging and his king is under mating threats. But the Moscow grandmaster prepared an astonishing riposte, turning the game around and forcing victory. Seeing that nothing works, Stein tries a little trick. White wins after 39...Rxe2 40.Qxh8+ Kxc7 41.Qc3+ Kb7 42.g4+-; or after 39...Rd8 40.Bxa6+ Kd7 41.Bb5+ Kc8 42.Qxe6+ Kb7 43.g3+-. Avoiding the trap: 40.Kxh2?? Bxc7 41.Bxa6+ Kd8 42.Qxc7+ Kxc7 and black has winning chances. White is winning and Simagin shows good technique. 50.Qb2+ Kc8 51.Qg7! Rh5 52.Qg8+ Kb7 53.Qxe6 Ra5 54.g4 Black resigned.